The Witteman-Lewis XNBL-1 "Barling Bomber" was an experimental long-range heavy bomber built for the United States Army Air Service in the early 1920s. Although unsuccessful as a bomber, it was an early attempt at creating a strategic bomber. The XNBL-1 (Experimental Night Bomber, Long Range) was designed by Walter Barling, who had previously designed the Tarrant Tabor, which was similar in concept but was destroyed in a fatal crash on its first flight in 1919. 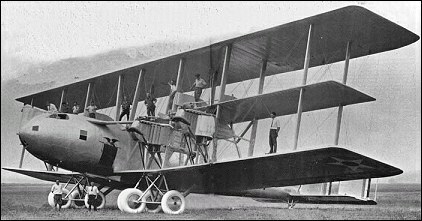 Like the Tabor, the Barling Bomber was a large six-engined triplane with a cigar-shaped fuselage. Unlike its predecessor, the XNBL-1 had a crew of seven and had all of its engines mounted level with the fuselage. The undercarriage had ten wheels, including two wheels towards the front of the aircraft (to prevent a nose-over on takeoff) and a tail skid. Components of the aircraft were assembled together to begin flight testing at Wilbur Wright Field. Final cost of the XNBL-1 project was $525,000, not including a $700,000 hangar to house the airplane. Although capable of carrying a 2268kg bomb load, performance was disappointing. A fully-loaded XNBL-1 had a range of only about 275km with a top speed of 155km/h. In contrast, the "short-range" Martin NBS-1 had a range of about 725km and could carry a 907kg at the same speed. On a flight from Dayton, Ohio to Washington, DC, the Barling Bomber failed to fly over the Appalachian Mountains and had to turn around. Although the XNBL-1 was not put into production, it had advanced features such as aluminum fuselage components, adjustable multiwheel undercarriage, separate compartments for crew, a flight engineer, electrical instruments, and advanced engine controls. The XNBL-1 was the largest aircraft in the United States until the Boeing XB-15 in 1935. Great article, mnetric system rules. I would like to know how rare actual photo's of this airplane are I have one and need to know how valuable it is. This aircraft was designed by the same man who designed Britain's unsuccessful Tarrant Tabor bomber, which is described elsewhere on this web site. Although the two aircraft look somewhat similar, the Barling Bomber lacked the engines placed between the two upper wings, a feature which proved disastrous to the unfortunate Tarrant tabor. This airplane was simply " too much airplane " for the powerplants available at that time. Built in my hometown of Newark, NJ, I wonder where the Witteman-Lewis Company was actually located. Perhaps at a facility at Newark Airport. yeah-where can i get a 1/48 plastic model-what company? This aircraft would make a very interesting subject for a model. Where could I get a good set of drawings???? Make it big enough and expensive enough and the military will buy one. � Armament consisted of seven 7.5mm machine guns on flexible mountings. � The pilots had a semi-enclosed cockpit with several side windows, but the position of the forward gunner's position largely blocked the view ahead. � The many struts and bracing wires created interference drag which contributed to the XNBL-1's stately progress. � The main landing gear had 10 wheels. The forward pair were mainly there to prevent a nose-over. � The incidence of the tailplane could be adjusted in flight using a lever in the cockpit.